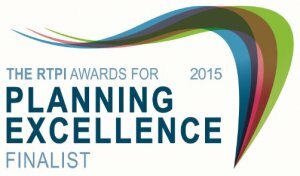 SF Planning Limited is extremely honoured to announce that we have been short-listed for the national Royal Town Planning Institute’s Planning Excellence Awards for 2015. The RTPI Awards highlight exceptional examples of planning and celebrate the contribution that planners and planning make to society. Awards are being made to a range of individual projects as well as to exemplary individuals, teams and practices. Imagination – Development and application of imaginative approaches and techniques to achieve high quality planning solutions. Satisfaction – Client/applicant/partners satisfied with the service provided. Management – Ability of chartered town planners to manage multi-disciplinary projects or to work within a multi-disciplinary environment. Inclusion – Commitment to inclusive planning that enables everyone to participate equally, confidently and independently in everyday activities. Development – Commitment to staff development, business improvements and active participation in professional and educational activities. A number of clients provided testimonials relating to specific projects in support of our bid to become the ‘Small Planning Consultancy of the Year’, thank you; and thank you to all our clients and those we work with for your help in getting us this far. The judging panel is made up of industry leaders and prominent planners. The awards will be made on 6 July 2015. SF Planning Limited is an independent planning consultancy in Cheltenham, Gloucestershire. The company was set up in 2005 by Simon Firkins. In 2007 SF Planning became a limited company. Mark Godson joined in 2008 and became a partner in 2010. The practice currently employs four chartered members of the Royal Town Planning Institute (RTPI). Further details on the team members can be found on our website. Simon (and later Mark) started off working from desks at home, before taking on office space at 12 Royal Crescent, Cheltenham in late 2009. We now occupy an entire floor at Royal Crescent. SF Planning Limited has built its reputation providing accurate and honest services mostly to small and medium sized developers and the business community generally. We provide expert advice to a number of public sector and charitable organisations. As the company has grown, so too has its geographical spread and the scale of projects we are involved with. Over the course of the last 10 years we have worked on well over 700 different sites, and in the order of 1000 different projects.